Earlier in April, Lee Mi Jung (이민정) was first seen in a beautiful red macramé lace dress from Valentino Resort 2013 collection to the press conference of 'All My Romance (내 연애의 모든 것)'. She acccessorized her look with a pair of gold Dolce & Gabbana earrings and gold peep-toe pumps. 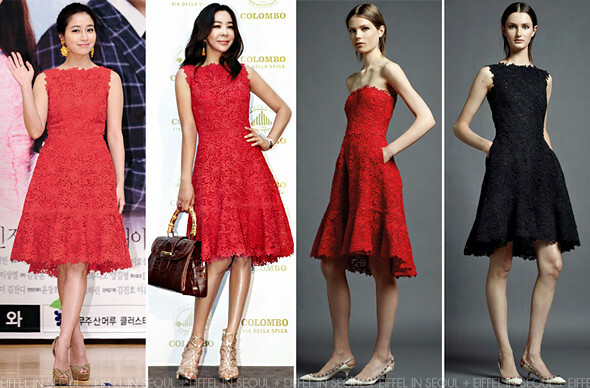 Lee Hye Young (이혜영) was seen wearing the same red dress at 'Blooming Moments At Colombo' event held on May 30, 2013. She accessorized her look with a pair of gold sandals and maroon bag from Colombo.